The TAC PRO® Kydex® adjustable rifle Cheek Rest has been designed to provide perfect eye alignment with the sighting system without compromising functionality. Adjustable cheek-pieces have become more popular in recent years, especially as the scope objective lenses have grown larger. In order to get a consistent cheekweld while keeping the eye in line with the scope a raised cheek-piece device is required. This is a common problem with factory stocks and even high end sniper rifle stocks without adjustable cheek rest. 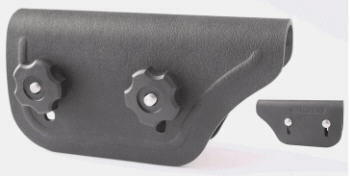 In addition, most “saddle” type cheek risers have parallel sides that add as much as 2cm or 3/4" to the width of the stock and force the eye out of alignment with the sights. The TAC PRO® adjustable cheek riser solves this problem with an ergonomic design that does not increase the width of the stock where the cheek rests while providing height adjustment. If you're struggling to get a good cheekweld and keep your eye in line with your scope you need this product. This model does not fit McMILLIAN A-5 Stocks. Made in Canada by TacPro INC.